Bankroll in need of a boost? 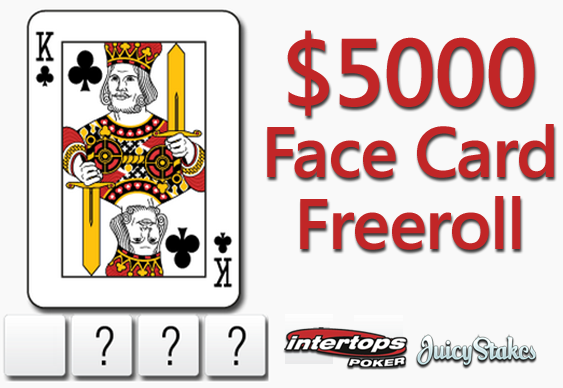 Revolution Poker Network sites Intertops and Juicy Stakes are teaming up this weekend to host a special Face Card Freeroll event. The contest takes place on Saturday 9th May with a prize pool of $5000 up for grabs. Players wishing to take part will have to build an access code. This information will be delivered via a number of sources including email, text message and by visiting the websites of the participating sites. Collect clues to build access code for freeroll poker tournament this weekend. You can get the first part of the entry code by visiting Juicy Stakes and Intertops Poker. Keep your account details up to date to ensure you receive all the qualification details. Of course it's not just freerolls that are on offer at Intertops Poker and Juicy Stakes. Players can secure seats into some great live tournaments such as the CPPT in St Maarten and WPT Venice too thanks to an extensive range of satellites. The latest packages up for grabs are for the $500K CPT Punta Cana Main Event in Dominican Republic.